Framus has unveiled the latest additions to its Legacy acoustic guitar line, the “all-massive” FD 28 Nashville EQ and FD 28 Nashville Cutaway EQ. The guitars feature select, “massive” woods throughout, including a solid AA Sitka spruce top, East Indian rosewood back and sides, plus a satin-finished mahogany neck and tiger stripe ebony fingerboard and bridge. Elsewhere, there's an Indian rosewood headstock veneer, with Vintage Grover machineheads, plus Fishman Prefix Plus T preamp systems, and Graph Tech TUSQ nuts and saddles. Finishes include Vintage Transparent Satin Natural Tinted, Vintage Transparent High Polish Natural Tinted, Vintage Dark Sunburst Transparent High Polish, while a separate optional black pickguard is included. 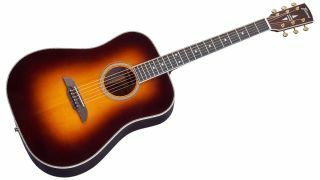 Framus's Legacy Nashville models are available now, with prices ranging between £1,221.42 and £1,374.11. See Framus & Warwick for more info.